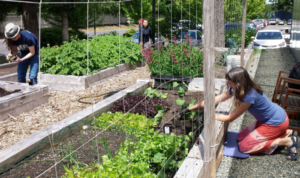 Karrin Peterson is Integrating sustainability into teaching and learning via the Bellevue College student garden. “Teaching and gardening are so very similar. In the garden, I help students plant seeds. With sun, water, and a little love, plants emerge and grow to feed our bodies and our minds with the marvel of life. Karrin Peterson and students in her English classes grow lettuce, spinach, kale, arugula, radishes and peas. Planter boxes form a row behind the greenhouse on the west side of campus where the students maintain and harvest their food. Back in the classroom, Karrin teaches English 101, 201 and 235 and has done so since 1999. She teaches research and writing; students are asked to choose two topics to write from and she assigns two topics that are related to sustainability. Though she admits she rarely uses the term “sustainability “ in her classroom discussions. “I teach research and writing, the process is always the same, the topic is irrelevant” says Karrin. “No matter the subject, my students must research and question both sides of an argument.” Research resources include CQ Researcher at the LMC, books by Michael Pollen, a textbook that is required and available for rent each quarter, and was the BC Reads selection for 2012-13, Deep Economy by Bill McKibben. The unique perspective Karrin brings to the classroom is her passion for the environment and her love of gardening. She grew up in Ogden, Utah, the granddaughter of a farmer who lived during both world wars and the Great Depression. Her father was a professor and an environmentalist so her love of nature and the earth is “intuitive” she says. An avid gardener at home, Karrin says “my whole yard is organic except that I use a tiny bit of Sluggo on my gravel walkway, slugs are pesky… I rotate my crops on about 400 square feet of terraced garden beds using the square foot gardening method.” One of her favorite books is Square Foot Gardening by Mel Bartholomew, which is on reserve at BC’s LMC. As BC’s Student Garden Counselor, Karrin believes that one way in we can get back to social equity is to be more connected to our food. “One way we can regain control of our food is to grow our own in our gardens.